Welcome Realmer! As I type this, the final hours are ticking down on 2018. What a year has it been for Aphotic Realm and we honestly couldn’t have done it without you! This year we published three short story collections, and three magazines, plus we published over 30 articles, reviews and free to read stories on our website! We opened the year with Shadows of the Mind: A Collection of Short Stories by Mandi Jourdan. Each story took place in her Shadows of the Mind Universe set in a futuristic world where cyborgs, betrayal, and government conspiracies abound. Mandi also has two full length novels, Lacrimosa and Veritas, published by Adelaide Books in this same universe. Next came Classified! Aphotic Realm Magazine’s third issue and a special one at that! Its release marked our one year anniversary! Among all the TOP-SECRET stories about conspiracies, alien, and other horrors, we interviewed the founder of Cemetery Dance Magazine, Richard Chizmar, as well as Mylo Carbia, screenwriter, best-selling author and the Queen of Horror! In May we released, Tales From the Realm: Volume 1. This collected twenty of the best stories submitted to our general, non-themed, online publication in 2017. Reviewers are giving it high praise; one such review even stated, “it reminded me of the old television series The Twilight Zone.” We’re pretty proud of this collection and the fantastic authors within it’s pages. Our June/July release for the magazine marked another milestone. Aside from being released on the anniversary of our first magazine’s release (Apparitions), we added more content! We’re always evolving, listening to feedback with one ear, and keeping our eye on design and aesthetics put together what is both functional and beautiful at the same time. With Dystopia, our fourth issue, we were able to change up the format bringing more content on fewer pages (ideally). We introduced Comics and Reviews, we even had a guest interview within these pages. Not to mention, we got to interview Ronald Malfi, horror best selling author and musician, as well as Kevin J. Anderson, the Master of Universes. A great issue, with fantastic fiction and content all around. September we released something quite fun, Grimdark Grimoires: A Dark Fantasy Anthology (volume 1). It’s easy for there to be a lot of “firsts” when you’re as young in the publishing world as Aphotic Realm is, however, Grimdark did break ground on something new for us. Some was behind the scenes, others you can see, such as the length of the story and content. Originally, we planned on this to be an individual release, however, we had so much fun with it, that we decided to slap the ole’ VOLUME 1 sticker on it and revisit this world later on. October/November issue releases and what did we do? We visited the mythos of H. P. Lovecraft with Eldritch! Each of the ten original stories while not official Lovecraftian tales, were written in the spirit of his universe. This issue also contains an interview with Lovecraftian scholar, and literary critic, S.T. Joshi. Earlier this year, a group of horror fans and book reviewers got together to form the Indie Horror Book Awards. They poured over tons and tons of content before finally narrowing down to their final results. 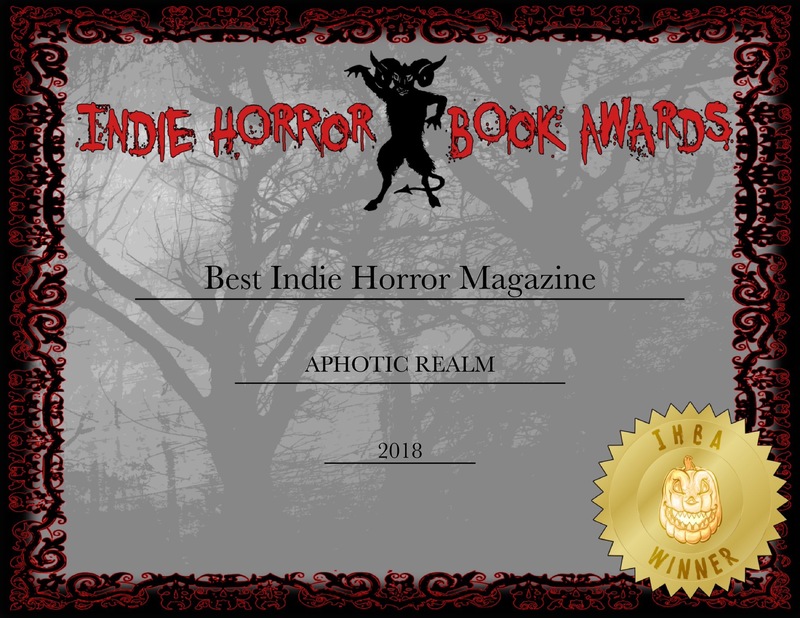 Aphotic Realm was honored with the Best Indie Horror Magazine: 2018! Thanks to everyone at the IHBA for this award! Congrats to everyone who submitted and contributed to Aphotic Realm–this award is as much yours as it is ours. We couldn’t have done it without you. That’s all she wrote for 2018. What’s next? We’ve already announced the themes/submission windows so be sure to check those out–I’ll still be recapping them below but more details will be on their official page. We’re going to have a quiet few months ahead. We’ve got some other projects brewing and we’ve had to push our January/February release (if you are comparing 2019 to 2018 at all–this is something we’ve never officially set in stone). Next will most likely be issue 6 FANGS in March/April. This should be a fun one. Creature feature. Cujo. Jaws. That kind of stuff in store. Looking forward to the reading period to begin so we can read all those FANGS stories patiently waiting in our Inbox. After that we’re going to be featuring a guest editor, Bo Chappell, editing an anthology of stories with the theme of Appalachian Horror! Really excited about this one! The Summer will bring issue 7 GRUESOME. Think–80s horror flick! The nostalgia is flowing through me now! Issue 8 is going to be our Halloween themed issue! Just in time for Halloween (provided the stars align properly and whatever dark gods in the publishing world accept our sacrifices). Naturally, we’re planning Tales From the Realm: Volume 2 next year. We’ll give you all more details once we have them. Don’t worry, the best of 2018 will be released next year! That’s just the publishing side of things. We have a few projects that are still in the early stages and too premature to talk about in any detail. But stay tuned for more from Aphotic Realm next year! We’d like to take a moment to thank Gunnar Larsen who hunted down stellar art for the magazine’s and provided original work for Shadows of the Mind, Tales From the Realm, Grimdark Grimoires and the artwork donated for our Reading is Fundamental Charity fundraiser. Thank you to Chris Martin, our Associate Editor, for taking the reins of the online publication despite his busy schedule. Thanks to Mike Durst for joining our team this year and jumping in when and where he can to help Chris (and our little team of readers) to sort through the submissions we receive. Thanks to everyone who submitted Movie and Book reviews this year. Thanks to YOU, Realmer for following and supporting us. May 2019 smile on you with all the horrific brilliance of a maniacal laugh. Happy New Year, From Your Aphotic Realm Team.